This article is about Cheyenne warrior society. For other uses, see Dog Soldiers (disambiguation). 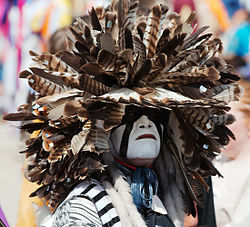 A modern Dog Soldier headdress at a pow wow. The Dog Soldiers or Dog Men (Cheyenne Hotamétaneo'o) was one of six military societies of the Cheyenne Indians. Beginning in the late 1830s, this society evolved into a separate, militaristic band that played a dominant role in Cheyenne resistance to American expansion in Kansas, Nebraska, Colorado and Wyoming, where the Cheyenne had settled in the early 19th Century. After the deaths of nearly half the Southern Cheyenne in the cholera epidemic of 1849, many of the remaining Masikota band joined the Dog Soldiers. It effectively became a separate band, occupying territory between the Northern and Southern Cheyenne. Its members often opposed policies of peace chiefs such as Black Kettle. In 1869, most of the band were killed by United States Army forces in the Battle of Summit Springs. In the 21st-century, there are reports of the revival of the Dog Soldiers society in such areas as the Northern Cheyenne Indian Reservation in Montana and among the Cheyenne and Arapaho Tribes in Oklahoma. The two central institutions of traditional Cheyenne tribal governance were the Council of Forty-Four and the military societies, including the Dog Soldiers. The Council of Forty-Four was the council of chiefs, comprising four chiefs from each of the ten Cheyenne bands, plus four principal or "Old Man" chiefs, known to have had previously served with distinction on the council. While chiefs were responsible for overall governance of individual bands and the tribe as a whole, the headmen of warrior societies maintained discipline within the tribe, oversaw tribal hunts and ceremonies, and provided military leadership. Dog Soldiers were noted as both highly aggressive and effective combatants. One tradition says that in battle, they would "pin" themselves to a "chosen" piece of ground, through an unusually long breech-clout "rear-apron", by use of one of three "Sacred Arrows" which they traditionally carried into battle. Prior to the peace council held at Bent's Fort in 1840, the Algonquian-speaking Southern Cheyenne and Arapaho were allied against their traditional enemies, the Comanche, Kiowa, and Plains Apache, who belonged to different language families and cultures. In 1837, while raiding the Kiowa horse herds along the North Fork of the Red River, a party of 48 Cheyenne Bowstring Men were discovered and killed by Kiowa and Comanche warriors. Porcupine Bear, chief of the Dog Soldiers, took up the war pipe of the Cheyenne. He carried it to the various Cheyenne and Arapaho camps to drum up support for revenge against the Kiowa. He reached a Northern Cheyenne camp along the South Platte River just after it had traded for liquor from American Fur Company men at Fort Laramie. Porcupine Bear joined in the drinking. He sat and sang Dog Soldier war songs. Two of his cousins, Little Creek and Around, became caught up in a drunken fight. Little Creek got on top of Around and held up a knife, ready to stab Around; at that point, Porcupine Bear, aroused by Around's calls for help, tore the knife away from Little Creek, and stabbed him with it several times. He forced Around to finish off Little Creek. By the rules governing military societies, a man who murdered or accidentally killed another tribe member was prohibited from joining a society. A society member who committed such a crime was expelled and outlawed. Porcupine Bear was expelled from the Dog Soldiers, and he and his relatives had to camp apart from the rest of the Cheyenne. The Dog Soldiers were disgraced by Porcupine Bear's act. The other chiefs forbade them from leading war against the Kiowa. Wolf reformed the Bowstring Society, which had been nearly annihilated in the fight with the Kiowa. it took over leading warfare against the Kiowa. Though outlawed by the main body of the Cheyenne, Porcupine Bear led the Dog Soldiers into battle against the Kiowa and Comanche at Wolf Creek. He and his warriors were reportedly the first to strike the enemy, considered an honor but, due to their outlaw status, however, their feat was not celebrated. The outlawing of Porcupine Bear, his relatives, and his followers led to the transformation of the Dog Soldiers from a warrior society into a separate division of the tribe. In the wake of the cholera epidemic in 1849, which greatly reduced the Masikota band of Cheyenne, the remaining Masikota joined the Dog Soldiers. When the Cheyenne bands camped together, the Dog Soldier band took the position in the camp circle formerly occupied by the Masikota. Prominent or ambitious warriors from other bands also gradually joined the Dog Soldier band. Over time the Dog Soldiers took a prominent leadership role in the wars against the whites. The rest of the tribe began to regard them with respect and no longer as outlaws. The Dog Soldiers contributed to the breakdown of the traditional matrilineal clan system of the Cheyennes. Customarily when a man married, he moved to the camp of his wife's band. Maintaining their separation, the Dog Soldiers brought all wives to their own camp. Other elements contributing to the breakdown of the clan system were the high rate of deaths from the 1849 cholera epidemic, which killed perhaps half the Southern Cheyenne population, particularly devastating the Masikota band and nearly wiping out the Oktoguna. Losses in the Sand Creek Massacre of 1864 further disrupted the traditional Cheyenne kinship system. The Third Colorado Cavalry caused heavy casualties among the Wutapai (Black Kettle's band); and killed perhaps half of the Hevhaitaniu under Yellow Wolf and Big Man, and half the Oivimana under War Bonnet. They also killed many among the Hisiometanio (Ridge Men) under White Antelope. The Dog Soldiers and the Masikota, who by that time operated as a band, were not at Sand Creek during the massacre. The Dog Soldiers band took as its territory the headwaters country of the Republican and Smoky Hill rivers in southern Nebraska, northern Kansas, and the northeast of Colorado Territory. They were allies of the Sioux-speaking Lakota and Brulé Lakota, who also frequented that area. The Cheyenne began to intermarry with the Lakota in that territory. Many Dog Soldiers were half-Lakota, including their chief Tall Bull. During the mid-1860s, Dog Soldier leaders, including Tall Bull and White Horse, frequently called on the great warrior Roman Nose, a Crooked Lance society member, to lead Dog Soldier strikes against white civilian and military assets. He led an attack on Fort Wallace in June 1867. Due to an increasing division between the Dog Soldiers and the council chiefs with respect to policy towards the whites, the Dog Soldiers became separated from the other Southern Cheyenne bands. They effectively became a third division of the Cheyenne people, between the Northern Cheyenne, who ranged north of the Platte River, and the Southern Cheyenne, who occupied the area north of the Arkansas River. A strong band numbering perhaps 100 lodges, the Dog Soldiers were hostile to the encroaching whites. By the 1860s, as conflict between Indians and whites intensified, the militaristic Dog Soldiers increased their influence, together with that of the warrior societies of other Cheyenne bands. The warriors became a significant counter influence to the leadership of the traditional Council of Forty-Four chiefs, who as generally more mature men, were likely to favor working for peace with the whites. In the late 1860s, the Dog Soldiers were crucial in Cheyenne resistance to American expansion. Dog Soldiers refused to sign treaties that limited their hunting grounds and restricted them to a reservation south of the Arkansas River. They attempted to hold their traditional lands at Smoky Hill, but the campaigns of General Philip Sheridan foiled these efforts. After the Battle of Beecher's Island, many Dog Soldiers were forced to retreat south of the Arkansas River. In the spring of 1867 they returned north with the intention of joining Red Cloud and his Oglala band in Powder River. Attacked by General Eugene Carr, the Dog Soldiers began raiding settlements on Smoky Hill River in revenge. Eventually, Chief Tall Bull led them west into Colorado. After raiding sites in Kansas, they were attacked by a force composed of Pawnee Scouts led by Major Frank North, and United States cavalry, who killed nearly all the band, including Tall Bull, in the Battle of Summit Springs in June 1869. Last of the Dogmen is a fictional 1995 film about the search for and discovery of an unknown band of Dog Soldiers from a tribe of Cheyenne Indians who escaped the 1864 Sand Creek massacre and survived for more than a hundred years secluded in the Montana wilderness. ↑ 1.0 1.1 1.2 1.3 Greene 2004, p. 9. ↑ Hoig 1980, p. 11. ↑ Hoig 1980, p. 30. ↑ Hyde 1968, p. 74. ↑ Hoig 1980, pp. 48-49. ↑ 6.0 6.1 Hyde 1968, p. 335. ↑ 7.0 7.1 7.2 7.3 7.4 Hoig 1980, p. 49. ↑ Hyde 1968, p. 75. ↑ Hyde 1968, p. 79. ↑ 10.0 10.1 10.2 10.3 Hyde 1968, p. 338. ↑ 11.0 11.1 Hyde 1968, p. 97. ↑ 12.0 12.1 12.2 Hyde 1968, p. 339. ↑ Hyde 1968, p. 96. ↑ Hyde 1968, p. 159. ↑ 15.0 15.1 Greene 2004, p. 26. ↑ 16.0 16.1 16.2 16.3 Hoig 1980, p. 85. ↑ Greene 2004, p. 27. Brown, Dee. (1970). Bury My Heart at Wounded Knee: An Indian History of the American West. Owl Books. ISBN 0-8050-6669-1. Greene, Jerome A. (2004). Washita, The Southern Cheyenne and the U.S. Army, Campaigns and Commanders Series, vol. 3. Norman, OK: University of Oklahoma Press. ISBN 0-8061-3551-4. Hoig, Stan. (1980). The Peace Chiefs of the Cheyennes, Norman, OK: University of Oklahoma Press. ISBN 0-8061-1573-4. Hyde, George E. (1968). Life of George Bent Written from His Letters. Ed. by Savoie Lottinville, Norman, OK: University of Oklahoma Press. ISBN 0-8061-1577-7.